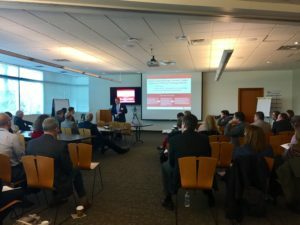 Last Thursday morning, BioForward held the first portion of its speaker series on how university research affects the biohealth industry and the state economy, featuring the University of Wisconsin-Madison. The event was held at Accuray in Middleton, Wisconsin. As a company with UW-Madison roots that developed a novel medical technology combining CT imaging with a radiation treatment delivery system, Accuray is familiar with the direct impact UW research has on the industry. 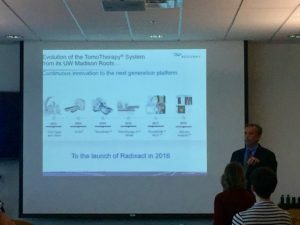 Rob Zahn, General Manager of Accuray’s Madison location, kicked off the event with insights into Accuray’s history, why they choose to continue to stay in Wisconsin, and the innerworkings of their innovative technologies. Rob also gave a glimpse of Accuray’s state-wide supply chain impact, with over $30 million in annual purchases from 55 Wisconsin-based suppliers. 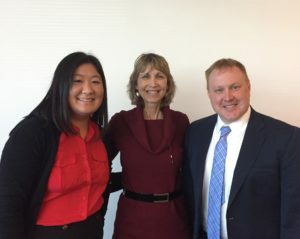 Lisa Johnson, CEO of BioForward, updated attendees on advocacy from a federal level after recently meeting with Wisconsin representatives in Washington D.C., including the consistent support for protecting NIH funding and the importance of continuously sending positive messages to our state legislators that our industry has a state-wide impact. Miller began the event with outlining UW-Madison’s impact on Wisconsin. Reminding attendees that the university is an economic engine for Wisconsin, with over $15 billion in annual economic impact. The university is also essential in developing the next generation of talent, especially in the biohealth industry. UW-Madison is additionally investing in research itself, supporting the UW 2020 project dedicated to funding research projects that have the potential to fundamentally transform a field of study. Crystal Potts provided an overview of the current budget proposal including an additional $105 million for the UW System, proposed compensation increase that is tied to savings from self-insurance, and limited capital budget funding for new buildings and maintenance. Potts also provided a look at the current funding landscape for UW-Madison, with the state providing only 15% of the overall funding. Why Should Wisconsin Invest in the University? Along with the economic and educational impact, Miller stressed the importance of funding to maintain their talented faculty and attract new faculty, and funding, to the system. With a growing interest in STEM, the university also needs additional resources to support the necessary increase in academic support and availability for its students. The proposed budget does not give UW bonding authority, providing a hurdle to several necessary projects that have already received the funding needed. Additionally, faculty workload reporting does not allow researchers the necessary to time to carry out their research while also fulfilling essential portions of their positions including education and outreach. UW-Madison has kicked off a number of initiatives to rally support including a media campaign, stakeholder advocacy, and bringing legislators to campus for a first-hand look at the progress being made at the university. To further their efforts, Miller encouraged attendees to contact their state legislators and ask them to invest in the UW-System and grant the university bonding authority. Miller also suggested supporters speak at budget hearings, expressing the impact the UW-System has made on your community, industry, and life. Learn more about taking action to support the university and the upcoming budget proposal here. Keep an eye out for an upcoming BioForward e-communication on how to contact your legislator and support the industry. BioForward will be holding the second part of their speaker series on how university research affects the biohealth industry and the state economy next week with UW-Milwaukee Chancellor, Mark Mone. Learn more and register here.